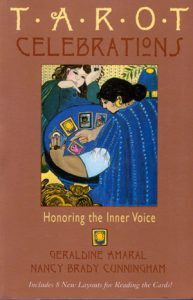 Geraldine Amaral is the co-author of Tarot Celebrations: Honoring the Inner Voice, creator of a Tarot instructional video, Tarot 1-2-3 and a regular columnist for the quarterly journal, Pathways Magazine. She offers Tarot classes in the Washington DC area, utilizing Jungian and archetypal psychology. In her classes, she teaches people how to apply the Tarot’s esoteric principles in pragmatic ways and as a tool for personal transformation. Geraldine is also an ordained minister in the United Metaphysical Churches. The Osho Zen Tarot, based on Zen Buddhism, is a deck that Geraldine is particularly drawn to and one she considers to be the most spiritual of all Tarot decks. “Unlike traditional decks, the images created by Ma Deva Padma have a contemporary feel and capture the uncluttered spirit of Zen, best known for its simplicity, spirituality, mysticism and paradox,” says Geraldine. Geraldine has recorded two classes for Global Spiritual Studies called Exploring your Spiritual Path with Tarot and Zen, in which she reveals how you can use the images and teachings of the Osho Zen Tarot deck to help you tune into the Divine Presence within. Click here to purchase recordings which you can download to your computer or device or receiev them stored on a DVD or USB flash drive. 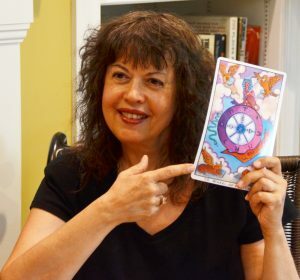 In this intervew, Michelle Alonso from Pathways Magazine, talks with Geraldine about her long association with Pathways, her personal journey with Tarot and Divine Metaphysics. Michelle: How did you first begin writing for Pathways? Geraldine: It happened somewhat accidentally. I sent in an article on a disk (remember those?) and I never heard anything about it. A few months later, I sent in another and then I got a call from Lou Desabla, Pathways publisher, saying that he liked the article and wanted to use it in the next issue. Of course, I was honored to be included in the magazine. Michelle: Later, you became a regular writer for Pathways, with your own column called Accessing Your Intuition. How did that all come about? Geraldine: After a few articles, I approached Lou and asked if I could have my own column and he agreed. The title of the column seemed like just the right way to describe what I was hoping to accomplish – to provide information that would help people use, develop, trust and understand their innate intuitive abilities. I especially wanted to explain how these abilities are accessible to everyone. Michelle: How soon after that did your book, Tarot Celebrations: Honoring the Inner Voice get published? Geraldine: First, let me say that my book would NEVER have been written if it had not been for Pathways and Lou. I didn’t even know I had a book in me! But after writing my column for several years, and becoming more confident as a writer, I decided to take all the articles I had written and organize them and use them as the basis for the book. You know, I will always be grateful to Lou for taking a chance on me, for encouraging me and giving me a platform to write about a subject that I am so passionate about. Michelle: Speaking of that, how did you get interested in Tarot? Geraldine: I had a reading about 30 years ago … when I was about 5 years old … (laughs) … just kidding, and it was so uncannily accurate that I became interested in learning how to use the cards for myself. This was a time in my life when I had very low self-esteem and things in my life were … difficult. I thought if I could see into the future, perhaps I could be a more self-sufficient and happier person. Little did I know that I was about to embark on a completely different journey, one that went beyond being able to see into the future. Shortly after my first reading in Massachusetts, I had an opportunity to move to Hawaii and it was there that I met my teacher, a Hawaiian Kahuna, mystic, spiritualist, and Tarot master. She was the one who taught me about the spiritual power of the Tarot. Most people associate the Tarot with fortune telling, based on a sensationalistic Hollywood depiction of the mysterious gypsy whose gifts may or may not be legitimate, and who typically offers some ominous prediction of doom and death. It’s unfortunate that this stereotype persists, but as people become more aware of the true gifts of the Tarot, it is slowly starting to change. There is another dimension to the Tarot, and that is as a means to explore and understand one’s inner self. When using the Tarot this way, it operates as an ‘inner technology’ that can help us harness our own personal power. Right now, there is an explosion of interest in Tarot and it seems that new Tarot decks are being created and published almost daily. If you want to see what I mean, check out www.aeclectic.net to see images from hundreds of decks. This is one of my favorite Tarot websites. I can easily spend hours and hours looking at the images from the multitide of decks you find there. Michelle: Why do you think there is such wide-spread interest in Tarot now? Michelle: So your approach with the Tarot is NOT about predicting the future? Geraldine: There is always an element of prediction, but my focus is on using the images on the cards to help understand how the unconscious mind is creating our reality, including the future. Rather than the future happening willy nilly, this approach says that objective reality is a reflection of our inner consciousness, especially the unconscious aspects of the psyche. By exploring the information we have locked up inside ourselves through the Tarot images, we can more effectively navigate the external world. Psychologists tell us that the information found in the unconscious mind is in symbolic form — images, pictures, symbols – similar to what we see in the Tarot. When we select a card, it is a chance for that image, the archetype trapped within the unconscious, to come forth for us to examine and discover what it means for us. So, it’s definitely not some “woo woo” fortune-telling experience! It is simply a way that we can communicate with this vast resource within, in its own language, the language of symbols. Michelle: How does your approach tap into the spiritual side of the Tarot? Geraldine: In conjunction with the archetypal exploration of Tarot, I incorporate the principles of Divine Metaphysics into my readings and this gives the individual who is having the reading specific tools to take the power back into their lives. My job as the reader is to simply act as a ‘midwife’ – so that they can allow the symbols on the cards to bring forth their own interior wisdom. When you get a reading in this style, the backdrop of the reading is to explore the spiritual reasons for what is happening in your life. When we are able to place our lives in this spiritual context, we can rid ourselves of a victim mentality. It helps us to focus, not on the external life events that are occurring, but on the larger question of what learning is behind what is happening. Hopefully, the reading helps you gain insights as well as specific tools you can use to improve, even transform your life. Michelle: Do you have a favorite Tarot card? From The Illuminated Tarot by Carol Herzer. Geraldine: Probably the Hermit (also called the Guide in some decks). To me it represents the real gifts and the real truth about Tarot – and that is that the cards can help us shed light on our life path. I have a little joke I often tell my students about this card. And that is, whatever your problem, whatever your question, whatever this issue at hand, this card, The Guide, is the answer. It is the Light of Spirit, the Light of Consciousness that can guide us, heal us, enlighten us, and help us to raise our own vibration to the frequency of the Divine. It’s similar to what Einstein said: “No problem can be solved from the same level of consciousness that created it.” The symbolism of the light from the lantern represents that higher level of consciousness that is accessible to each of us. It’s ironic — people always ask me if I really believe in Tarot cards and the answer is unequivocally “NO!” I don’t believe in Tarot cards, per se. They have no intrinsic value — they are pictures painted on card stock. But what I do believe in is the POWER of CONSCIOUSNESS and the Power of Spirit to work through the images to communicate with us at very deep levels. 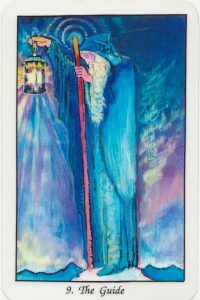 The images on the cards help us bring darkness and shadow issues into the light of consciousness, like the light we see in the Guide/Hermit image. Michelle: Moving on to Divine Metaphysics – how does it differ from other religions? And how did you become involved in a ministerial program based on Divine Metaphysics? Geraldine: I began studying Diving Metaphysics years ago, in Hawaii, at Unity Church. I was raised Catholic, and after the quilt and shame I experienced from my Catholic upbringing, I was so happy to find a spiritual path based on a more gentle God. It was really like a breath of fresh air for me, and very healing. I soon became completely enamored with the religion and philosophy of Divine Metaphysics and read every book I could get my hands on. The biggest difference between Divine Metaphysics and some other religions is that we do not see God as a personification – the white-robed man sitting on a throne. Rather, we understand ‘God’ to be an energy, an intelligence – actually, an Infinite Intelligence, a pure energy, a field, if you will, of pure potential. As part of this pure energy field, Divine Metaphysics teaches that beyond the physical world, there are other dimensions of matter and energy. You could call this a ‘cosmology’ of the universe in which the power of the mind is huge. It practices and teaches the spiritual truths recorded in the Bible and other Sacred Scriptures, and as revealed in the life of various Avatars of God, including Jesus the Christ. Image from an article about Edgar Cayce in The Event Chronicle. So the cornerstone of Divine Metaphysics is the study of the power of the mind beyond the physical world. Edgar Cayce said it best: “Mind is the builder” and this idea tells us that our minds are one of the most powerful tools available to us. And we use only a small portion of that vast resource (scientists say maybe 3%). So, we believe that ‘thought creates’. When we study or use Divine Metaphysics it is because we want to develop our personal growth, we want to have better command of our relationships, career fulfillment, optimal health. We want to develop a calmer nature, unconditional love for ourselves and others. We want to use what we know about the mind to contribute to the ‘global mind’ and a consciousness of unity and peace. Another important component of Divine Metaphysics is that we are not victims – of anything! We believe that we have soul or sacred contracts that map out the life experiences necessary for our soul’s evolution, but we still have free will. There is an internal plan that directs our thinking and actions, but through study, prayer, self-awareness, and meditation, we can learn what we need to learn and move on. We believe in personal responsibility and that we are the directors of our life. It is a refreshing idea when you consider that we live in a victim-driven culture. Divine Metaphysics also teaches that there are certain Universal Laws that govern our existence on this earth plane. As we live in accordance with these laws, as we live in harmony with these laws, we better our lives. Some of these laws include the Law of One, the Law of Mind, the Law of Love, and the Law of Karma. But there is not a lot of dogma involved. In that sense it is very similar to what Buddha taught. Each individual is encouraged to worship the Divine according to the dictates of his or her own conscience. And finally, we also believe in the continuity of life and the ability to communicate with those who are no longer in physical form. We think of death as a rebirth into a world of higher vibrations — a door to other dimensions. So, there is no death in this cosmology of existence. Michelle: Finally, are there any spiritual sayings or quotes that hold particular insight for you? 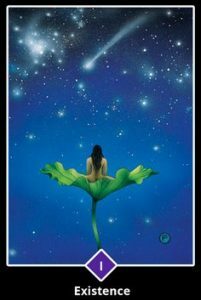 For more information about Geraldine, visit her website at www.thespiritualtarot.com. How do you see the Tarot ‘working’? What do you think is behind the increasing interest in, and acceptance of the Tarot? Did Geraldine’s discussion about Divine Metaphusics set you thinking? We’d love to hear from you!